I have sort of become obsessed with rhubarb lately. We went through this phase where either Zack or I was making strawberry rhubarb crumble every week, which is fine because who doesn’t love the tangy flavors of rhubarb mixed together with the sweetness of strawberries and topped with a sugary crumble crust?! The problem is that we were not only making it every week, we were eating it every week. And by we, I mean I. Believe it or not when your eating something that is mainly fruit, you’d think it was healthy for you, ha! Not so much. I gained just a couple of pounds over the course of the month, and I sadly blame it on my strawberry rhubarb obsession. Ah well. Then I remembered this recipe and alls well that ends well, right?! About a month ago my best friend posted this recipe on my wall on Facebook from Raising Generation Nourished , and I thought it was a much better option then my sugary crusted crumble I was downing my the platefuls every week, so I gave it a shot. Pretty good I must say. The flavors of strawberry and rhubarb are very prominent in this, the rhubarb a bit more then the strawberry, but I enjoyed it because like I said I am sort of obsessed with rhubarb lately. You can always taste as you go, and dial up the sugar, but I really liked the slightly sweet slightly tangy flavor profile going. In a small saucepan place your rhubarb, strawberries, and water over medium high heat. Using a potato mashed or one of your stand mixer paddles, the one with the flat bottom, mash the mixture breaking down the strawberries and rhubarb, helping to bring out the juices of the strawberries. Add your choice of sweetener. Do a small taste test, careful mixture will be getting hot, and add more if needed. Once your fruit is broken down quite a bit, place into a blender (I just use my Ninja) and puree. Place the pureed mixture into the freezer for 20 minutes or fridge for 45 minutes to an hour. Once your mixture is cold, whip your cream with the vanilla until soft peaks form. Fold your strawberry rhubarb mix into your cream. 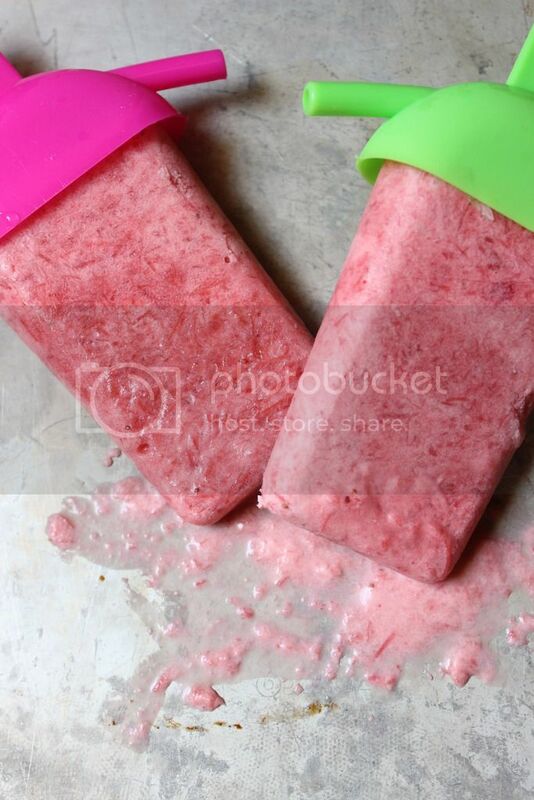 Pour your mix into your popsicle molds and freeze overnight for best results. I don’t really care for rhubarb too much. I’m an odd one I know. My mom had some in the garden and I don’t know if she didn’t make it very good or what. But I didn’t like it and haven’t ate it every since. Maybe a retake? It’s a tough one to cook with. You have to find the right balance of sour and sweet. You should definitely go for a retake! Wow, this looks all kinds of awesome! ~M. Hmm. I have never seen rhubarb in a frozen application. These would be fun to try! It’s definitely a Popsicle to try out! Mmmmm! I want one right NOW. I’ve always loved rhubarb but it’s been so long since I had it. It’s so good with strawberries, too. Hope you get to make one soon! Your so lucky to have it growing in your yard!! Hey, why not? It’s a great combination in a pie, right? Thanks for linking up with us at Thursday Favorite Things! Woo these look so good!! You know what, I’ve never been a huge fan of rhubarb…but these look so delicious, I might be up for changing my mind! Thanks so much for taking the time to link up at the #HomeMattersParty – we hope to see you again on Friday! Rhubarb was scary for me, because I just didn’t know what to think of it. But I love how it pairs with strawberry. It really helps with the flavor. 🙂 I hope that you give these a try! Visiting from the Recipe Swap. These look great. I think the cream is truly your secret ingredient in pulling the flavors together. My husband has asked me multiple times for a strawberry rhubarb pie, but I hate to bake. I wonder if he’d accept this as a substitute? Thank you for posting this to Merry Monday! Yum! I’ve got to try this! I love rhubarb and strawberries, so it’s a win-win! thanks for sharing, visiting from Monday Funday Link Party! If you love that flavor combo, you’ll love these! This is so interesting! I would have never thought to do this! Definitely an interesting way to eat strawberry and rhubarb. I would just love one of your Creamsicles! Hope you are having a wonderful day and thanks so much for sharing your awesome post with Full Plate Thursday! Hmm, strawberry rhubarb jelly sounds yummy! Strawberry rhubarb sounds like such a wonderful combo, and I bet it’s even better in creamsicle form. 🙂 Thanks for stopping by and sharing this recipe with us – you’re featured this week on Five Friday Finds as most popular!